Good morning, I hope you all had a lovely weekend. Katie and the team have been busy creating fabulous parties again this weekend and I am looking forward to sharing the Minnie Mouse party here on the blog on Wednesday. In the meantime I have a wonderful giveaway to share with you all today. The Little Ark make beautiful handcrafted furniture for children. Every piece is made to high standards by British craftsmen and made to order to allow the customer to personalise the chairs and tables as they wish. 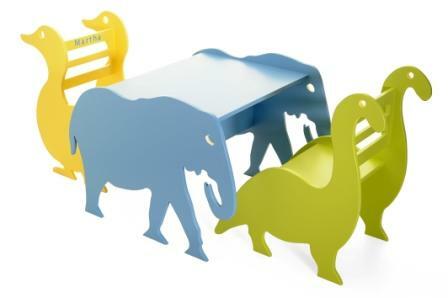 As their name, The Little Ark suggests their furniture designs include various animals and I assure you that you will want to have them in twos as they really are fantastic. All of the chair designs from The Little Ark can be personalised with your childs name and there is a choice of five colours available for each piece of furniture. However you are also able to purchase a blank, unfinished chair of you choose to paint the chair yourself. All of The Little Ark’s furniture is made from sustainably sourced timber. 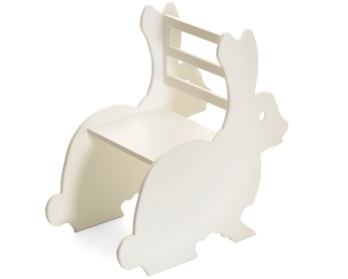 The Little Ark have very kindly offered to give one of you, our very lucky readers, the chance to win a Ronald The Rabbit chair. This chair will be supplied to the winner in a pure white colourway, which is currently not a colourway offered by The Little Ark. Ronald The Rabbit measures 585mm deep, 350mm wide, 600mm high andthe seat height is 300mm. This fabulous little chair would be perfect in your childs bedroom, in their playroom or the lounge or infact any room in the house. To win this chair there are a number of things you can do to enter. In order for your entry to count you must leave a comment below. Please leave a seperate comment for EACH action you take. Visit The Little Ark and leave a comment below saying which animal would be your childs favourite choice. Blog about this giveaway with a link back to this competition post. Competition is open to UK residents only and will be open until midnight on Sunday 27 November 2011. the winner will be chosen at random and will be announced on this blog on Monday 28 November 2011.